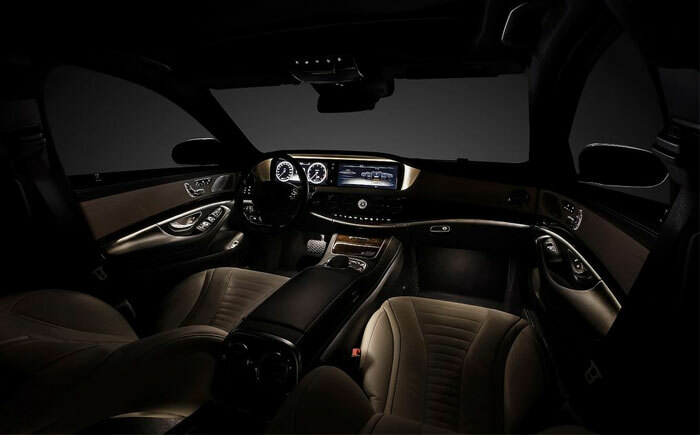 The new 2014 Mercedes-Benz S-Class – codenamed W222 – offers five rear seat variants including an Executive seat with reclining backrest for added comfort; brings interior innovations such as ‘energising’ massage seats. Not that the driver lacks for anything: the very latest Mercedes-Benz research findings have been incorporated into his immediate surroundings. These clearly confirm that certain comfort characteristics have a direct influence over driver fitness and wellbeing during and after a journey. Comfort is also conducive to safety. With its clear-cut architecture, the interior design of the new S-Class is the embodiment of a classic, serene and yet ultra-modern saloon car. Features include seatbelt holsters that rise electrically when passengers get in to aid seatbelt fastening. There is generous use of wood trim, especially in the dashboard and center console. The front seats are said to be 20kg lighter, mainly thanks to a new steel and plastic construction method. This enables the forces from the backrest attachments to be symmetrically introduced into the seat base. The front seats of the new S-Class are electrically adjustable for length, height, inclination and seat cushion depth. The 4-way Power lumbar support and head restraint height can be equally conveniently adjusted at the touch of a button. There is a further advantage for the seat belt system: unlike with other seat structures, the belt buckle and anchor fitting not only move with any fore-aft adjustment, but also with seat height adjustment. Working together with physiotherapists and psychologists, the seat specialists at Mercedes-Benz have developed a unique massage function with 14 separately actuated air cushions in the backrest, as well as an integrated warming function. A new individual climate control system called Thermotronic seems optimised for polluted Chinese cities. New features include completely autonomous adjustment options for the driver and front passenger sides, also for the individual automatic modes with their climatic settings of “Focus”, “Medium” and “Diffuse”. The centerpiece of the new COMAND Online system is the Intel Atom, a processor whose performance fully equals that of components in the latest laptops. The new S-Class is the first vehicle worldwide to offer a genuine multi-user system for entertainment functions. This means that there is independent access to the media sources of the entertainment system from any of the four seats – ie radio, TV, internet, navigation, DVD player and USB-connected devices. The innovative Frontbass system developed by Mercedes-Benz and used for the first time in a saloon car is a feature common to all the audio systems: the woofers are housed in the firewall, and use the almost 40-litre space in the cross-member and side member as a resonance chamber. The new navitainment functions include an animated compass, the “Driveshow” for passenger information as in an aircraft, and the display of Google Maps on the head unit and in the rear.